Madre in Marrickville opened last week and already qualifies as my new favourite pizza place. 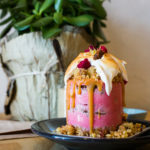 Maybe I’m a fast mover or maybe I was always pre-destined to be in its fan club, as this new eatery is from the excellent team behind Two Chaps – a venue I’m always happy to cheerlead for. 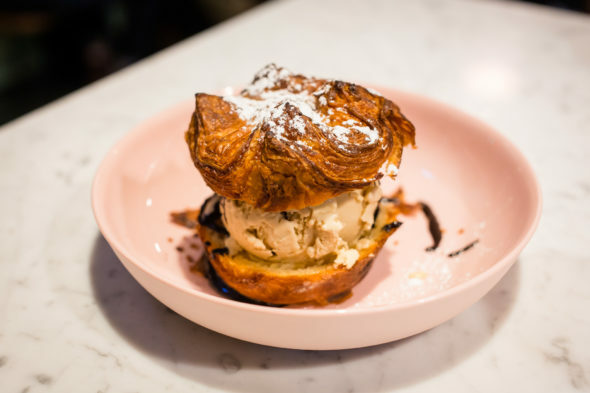 Like its sibling cafe, Madre’s output is all vegetarian and it’s all certifiably good. It also follows Two Chaps’ impressively overachieving “make it from scratch” ethos. 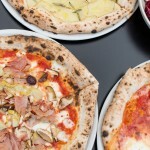 Just as the bread and pasta there is produced in-house with local ingredients, so are Madre’s pizzas. In fact, the name (Italian for “mother”) will clue you onto how the pies are created – with the mother dough (sourdough starter) from Two Chaps’ bakery. And the approach is radically Australian rather than textbook “authentic”: Piero Pignatti Morano and Kim Douglas don’t use Italian tipo 00 flour, but a sustainable domestic alternative. 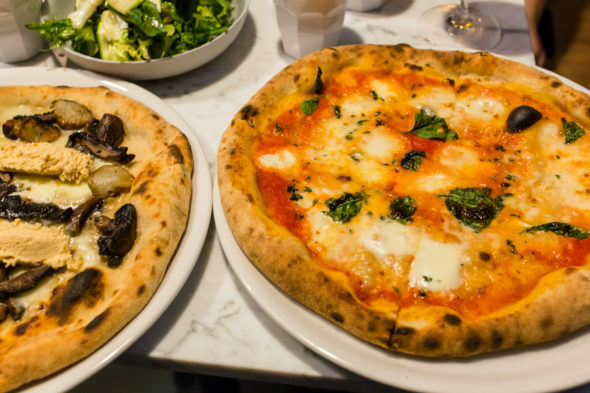 Funnily enough, keeping things very close to home is actually a trend that echoes Italy, says Kim – Piero’s brother lives in Naples, the ground zero for pizza, and says the emphasis there is on creations that showcase the local. 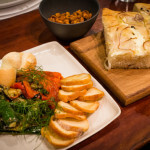 So the blistered greens on top of the three-cheese pie here ($24)? They’re indigenous warrigal greens and cavolo nero tips from Moon Acres Farm in the Southern Highlands. The charred leaves are the perfect corrective to the triple threat of blue cheese, washed rind and fior di latte. Instead of stomach-cramping, cheese overkill, Madre’s version is well-modulated: gloriously rich, but not crushingly so. The sourdough base has the right amount of earthy heft and crisp lightness and the hazelnuts layer on an extra savoury dimension. Also really good: the Madre Margherita ($21), with its bonus scorch of smoked buffalo mozzarella. 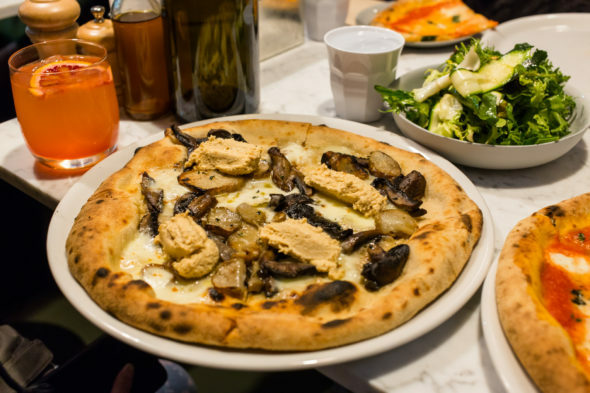 But my outright favourite from the wood-fired oven is the Portobello Mushroom ($24) pizza, with lemon thyme, smoked cauliflower hummus and knock-you-out slices of roasted Jerusalem artichokes – the blazing 400C heat unlocks their ultra-savoury, caramel intensity. Everyone is basically defenceless against how good this pizza is. You’ll see it land on lots of tables – a not-so-official poll confirming why you need to request this topping. Then there are other contenders I hope to soon add to my data set of “Pizzas I’ve Dug at Madre”. Maybe the Romanesco with Chilli, Ricotta and Oregano ($23) or Fresh Tomato with Fior di Latte, Black Olives, Capers and Chilli ($22)? The menu is short, but gets a refresh every month also, so there are still many reasons to keep revisiting. Just as Madre’s menu turns the spotlight on local ingredients, the drinks list also is headlined by Aussie beverages: you’ll find small-batch wines, from Sparrow & Vine tempranillo to a Delinquente pet nat, as well as an all-Australian Negroni and a pale ale by Grifter Brewery (made within actual walking distance of Madre). Even the floral arrangements seem to be in keeping with the native theme. This 30-seater corner restaurant already attracts queues (thanks to Nick Jordan’s early write-up), so I probably don’t need to give its popularity a signal boost. I think this pizzeria is worth singling out, though, as there’s nowhere around like it – it’s a vego pizza joint so thoroughly dedicated to the local that the only Italian thing about Madre is perhaps its name. It actually reboots the Boot. And its sourdough slices remaster expectations of what, exactly, pizza in Sydney should taste like. Thanks to its inspired flavours, it’s an excellent co-sponsor of your carb cravings as well. 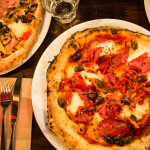 And even though it’s brand new, Madre deserves a ranking on Sydney’s honour roll of pizza joints. It’s the mother of fresh ideas. 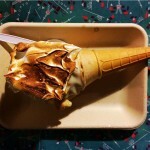 Madre, 205 Victoria Road, Marrickville, www.instagram.com/pizza.madre. Actually never heard of this joint till I saw your IG post haha. Haven’t gone pizza hunting in a while this will be at the top of my list and I’m ordering everythinf you ordered haha. Thanks so much Rafael! Definitely worth seeking out – maybe be ready for a takeaway run if it’s too crowded (it’s a small joint, so that can happen easily)! The Jerusalem artichoke one is so great! Lol, a shout-out! How fun. Really though, this place is the bees knees. I’ve been twice already and I never go anywhere twice besides my local ice cream joint. Thanks for getting on your loudspeaker about it! It’s great that people know about it – it could easily get overlooked as it’s on such a quiet corner. And yes, it’s definitely a place worth return visits!